Across the spongy tundra of the Lower North Shore, a variety of fruit bearing plants grow in June, July and August, and in some cases, well into September. 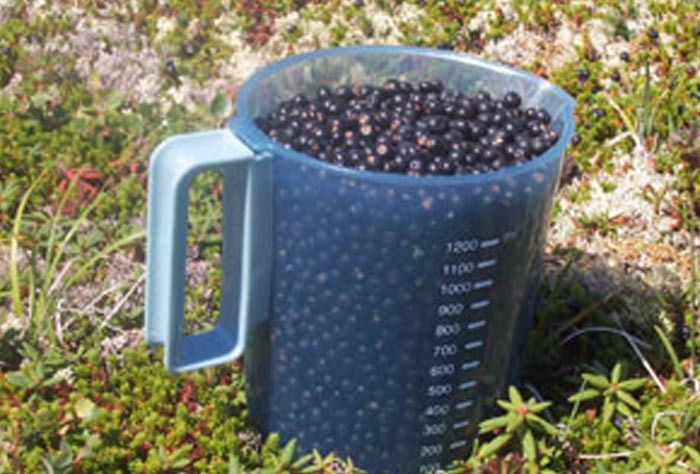 These wildberries can be found on barrens, near bushes, or on marshes. One of the most cherished berries along the Coast is the cloudberry, locally known as the bakeapple. This fruit ripens from a hardened berry, red in colour, into a soft orange or amber coloured berry that resembles a large raspberry. Cloudberries are juicy and rich in vitamin C. Other common berries found on the Lower North Shore include cranberries, crowberries (known locally as blackberries), partridgeberries (also known as lingonberries or redberries), blueberries and raspberries. Once these wildberries ripen, it is tradition to pick them for use in local recipes and dishes. Although cleaning the berries can be time-consuming, some of the greatest aromas and tastes can be found in a kitchen “boiling down” or baking with these local fruits. Jams, jellies, pies, muffins, cakes and puddings are all popular goodies that grace the tables of Lower North Shore homes, and can be found in many of the area’s restaurants. Home made berry wine and berry liqueurs are also increasingly popular products. In most communities, there are no designated zones for picking berries, nor any permits required.